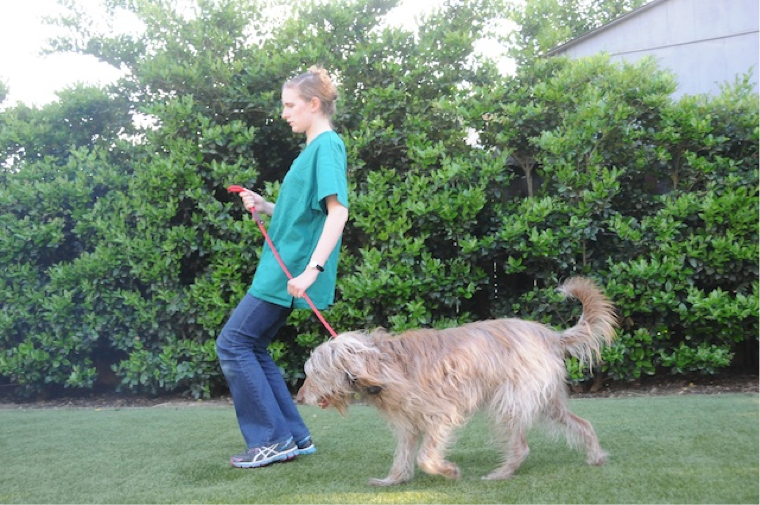 People frequently ask me why I use hands-free leashes in my dog classes instead of letting owners hold the leash. One main reason is the hands-free leashes allow the clients to easily handle and deliver treats quickly, in rapid succession, and with correct timing. A less obvious but very important reason and my answer: Have you seen what people do with a leash in their hands? I remember attending a seminar early in my career by Patricia McConnell where she showed a video of chimpanzees handling objects. They grabbed, swung, lifted and pulled at these objects. Her point was, primates can’t help but manipulate objects in weird ways. What type of weird ways do human primates handle leashes? #1 For one, we like to grab things and pull them up in the air. We humans tend to hold leashes up and tight when we want a dog to stop and stand stationary. The appropriate direction to hold the leash when trying to give a dog a cue to stop is backwards, not up. #2 We grab things and hold them high, even when stationary. Humans also tend to hold the leash up and tight when standing around stationary. When we're not standing stationary, we are randomly shortening and lengthening the leash so the dog has no idea what location or position will lead to a loose, comfortable leash. 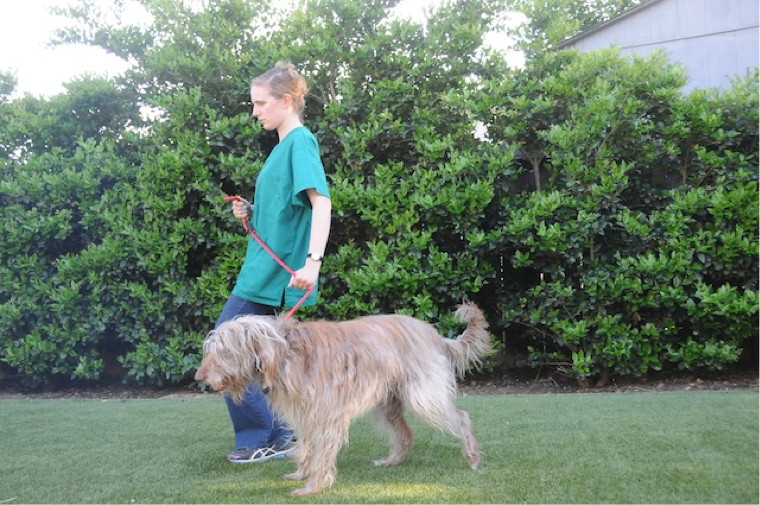 Instead, we should shorten the leash to the length we want that will allow the dog to move. This way the leash is loose when the dog is in an approved location and tight only when he tries to move out of position. #3 We even raise them above our head. An entertaining habit of humans is the need to pull the leash above our heads in order to pull it short enough to give a quicker stop-cue. A better way to shorten the leash is to gather it in one hand so that both of your hands can stay low. Then, slide your hand down the leash to indicate a stop-cue. #4: And tend to love the false control, even when just walking. Not only do we tend to pull the leash tight when standing stationary, we also tend to want to hold the leash tight all of the time while walking a dog from place to place. As a result, the dog learns that the leash will be tight no matter what, so there is no need to try to walk on a loose leash. The leash should be loose when the dog is in position or about to get into position. 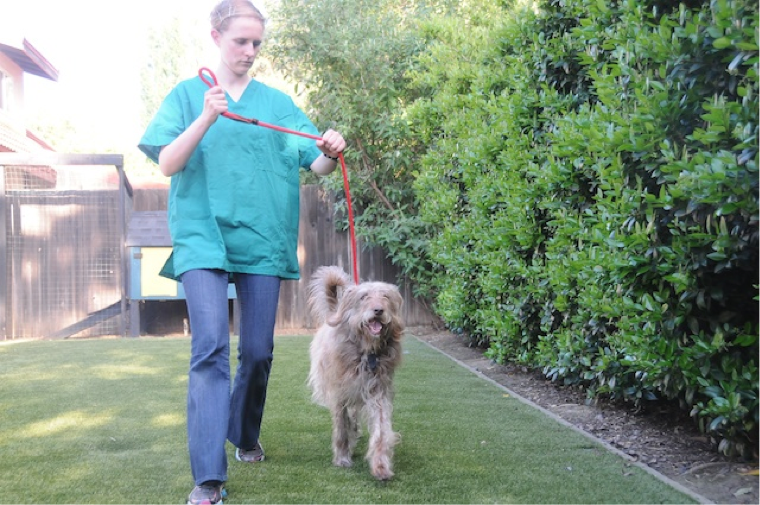 It should only be tight for a few seconds at a time when you need to guide the dog to catch up to you or to get back into position when he’s straying off course. #5: We humans also often do some unsafe things with the leash, such as wrapping the leash around our hand. We often wrap the leash around our hands, which is dangerous. 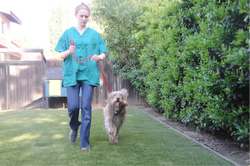 If the dog startles or sprints away this can lead to broken fingers and sprained hands. A better method is to place your hand in the handle and then gather the leash in your hand instead of wrapping it around your hand. If needed, get a wider leash for better grip. When the leash is gathered, it should not come out of the top of your hand. If the dog pulls, you would need a lot of wrist strength to control it. The leash should extend from the bottom of your hand down towards the dog. #6: Or grab the leash in ergonomically odd ways. Humans often hold the leash awkwardly. Here, the hands are facing the incorrect direction. This is ergonomically incorrect. Instead, your pinkies should face downwards and your thumbs up. With all that can go wrong with holding a leash, hands-free leashes allow humans to learn the natural body posture and movement that help guide a dog. 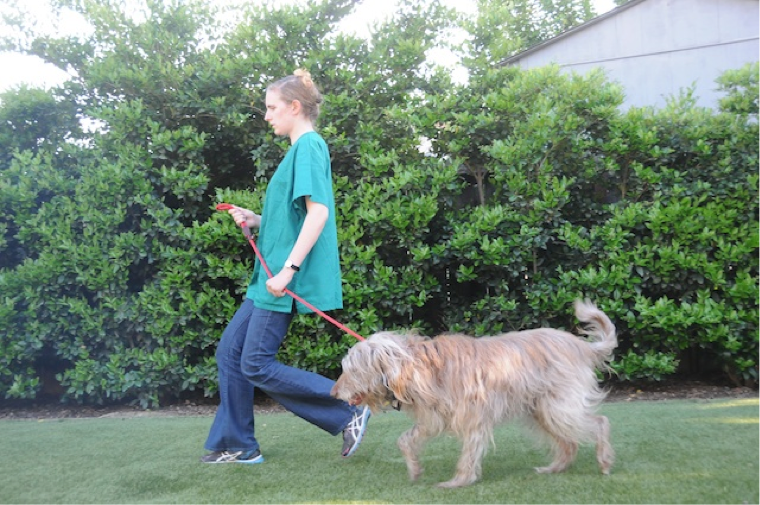 Once the handlers have practiced good habits, then they can go back to to using a regular leash. It’s a win for everyone!